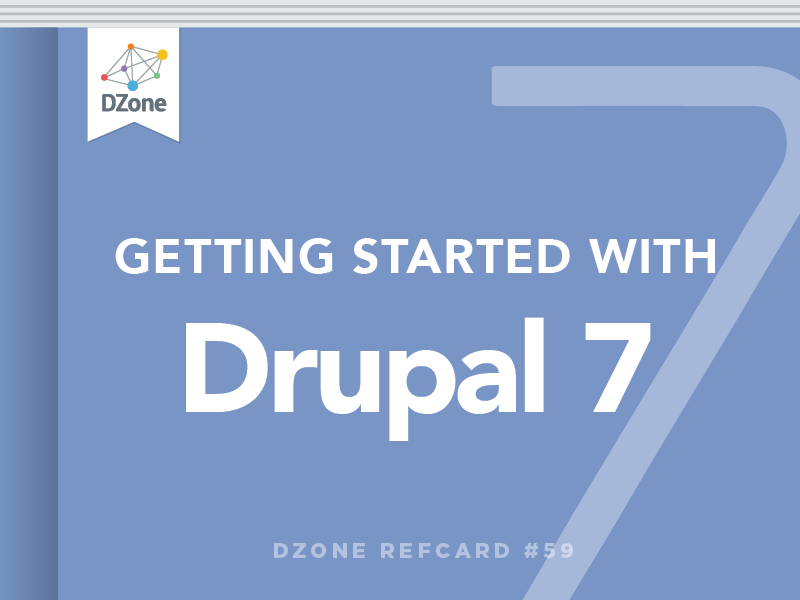 Introduces Drupal 7, including a discussion of Drupal pages, from types to content nodes, and instructions for installation. Though Drupal could be described as an open-source content management system, in reality it is much more: a framework upon which web developers can build many types of online experiences, including database-driven websites, document repositories, interactive applications, and more. The word page is often used inconsistently in the Drupal community, but for this guide, I'll use webpage to refer to that which is displayed via a URL path such as /about or /contact-us. By understanding how a webpage is created in Drupal by default, you will better understand the tutorials to follow. A header displaying the logo, site name, site slogan, and more. A main menu that includes links to the section landing pages. Multiple regions where you can place blocks of content and other functionality. A region displaying pages that define the webpage URL. Starting at the top, the content in the header area is managed in multiple locations. Site name and slogan are entered in the Site information, the logo is uploaded in the theme settings, and if you want other features to show in this area, your theme can be customized to accommodate. The Main Menu is typically used to display links to the main sections of your site. The Navigation Menu provides links to create content and might include other links generated by modules. The Management Menu is the black admin bar you will see across the top of your screen. The User Menu includes the My Account and Logout links. You can create your own menu as well. All menus are available as blocks and can be displayed in page regions. The quantity, placement, behavior, and style of webpage regions are defined by your theme. The diagrams on this page show sample theme regions. There are countless region configurations if you create your own theme. Regions can hold one or more blocks. If a block is not present, the region will collapse and become undetectable to the user. For this guide, the word page refers to that which appears in the content region (see diagrams). Pages generate URL paths that, in turn, deliver the webpage. The most common page is the node. The node is your article, your blog post, your event page, and so on. Other types of pages include (but are not limited to) the following. Default teaser pages. By default, Drupal's homepage displays a teaser list of nodes. It also has a term teaser page, which displays all nodes tagged with a specific taxonomy term. Views pages. These pages help you query the database and display bits of information about your nodes or other data. Views pages don't come by default with Drupal, but they're usually added when developing a site. Panel pages. By including bundles of page layout modules, Panel pages provide a means of creating custom pages and node page layouts. Webform pages. Webforms are online forms used to collect data from users and export that data for use elsewhere. Examples include a survey, contact form, sign up form, and so on. Module pages. Module pages vary based on the module. If a module displays content or a form, it will likely come with a URL path for you to use. For example, the search module produces a search results page. Administrative pages. In order to configure Drupal, you need to use Drupal's administrative pages. If you develop a module, you might create an admin page to configure the module. Nodes are created using content types. Content types are Drupal forms used to collect, relate, and display data in the content region of the webpage. Content types have at least five things in common: a title, body (most of the time), author, post date, and URL path. But you can add more. Two content types come enabled by default: Basic Page and Article. Four content types come preconfigured in module and are available to be enabled: Blog Entry, Forum Topic, Book Page, and Poll. You can also create your own content type. Article Used when type of content will be added on a regular basis. Includes an image and a tags field. Promoted to the default teaser homepage. Blog Entry Alternative to Article. Comes with multiple teaser pages and links to user's blog. Book Used relating nodes similar to a table of contents. Unique book navigation on the node and a book navigation block. Outline feature that creates the relationship works on all content types. Forum Topic Used to post a discussion topic in a forum. Comes with multiple forum list pages. Engages Drupal Taxonomy system to organize topics into forums. Poll Ask your visitors a single, multiple-choice question. Choose the number of options for the question and length of availability. Comes with a list page and with most recent poll question displayed. After you've planned your site, the next step is to install Drupal on a web server. For detailed documentation on Drupal installation, please visit http://drupal.org/documentation/install. These instructions focus on installing Drupal on an actual web server. If you aren't ready to commit to a hosted solution, you can learn Drupal via a Drupal site installed on your personal computer. One way to set a site on your computer is to use Acquia's dev desktop. This package will convert your computer to a local web environment and set up your Drupal site in a matter of minutes. Go to https://www.acquia.com/ downloads and download and install the Dev Desktop just as you would any other software package. 1. Click on Configuration in the black admin menu at the top of your screen. 1. Click Add content in the grey shortcut menu at the top of your screen. 2. Click the type of content you want to create. 1. Click on Find Content in the grey shortcut menu. 2. Use the filters to find a specific type of content. 3. Update one or more nodes with the update options. 4. Use the operations to edit or delete a node. 1. Click on Structure in the black admin menu. 2. Click on Content Types. 3. Click on Add Content Type. 4. Complete the form. Note: review each option carefully. There are too many to convey here. 5. Save your content type or save and add fields. The configuration options apply to the nodes that the content type will create. When creating the node, you can override many of these settings node-by-node if you have the Administer Content permission. You can add fields to all contents types, even those content types created using a module. The steps to add a field will vary, depending on the field you're adding. You have two options: 1. Use a field whose type comes with Drupal, or 2. Use a field module downloaded from Drupal.org (see the Modules section of this card). 1. Assuming you aren't already in the Manage Fields interface, click on Structure and then Content Types. 2. Click Manage Fields for the content type to which the field will be added. 3. Locate the Add New Field option. 4. Enter a label for your field, type of data, and form element. Before you save, you have the option to edit the field name. 6. Read the screen that follows and respond accordingly and click Save Field Settings to be sent to the field configuration interface. 7. Read the configuration options, respond accordingly and click Save Settings. Drupal comes with an image and term reference field (Tags) for the Article content type. If you want to add an image field to an existing content type or your custom content type, you can reuse the existing image field. Should you reuse a field? Here some factors to consider. Will you want to change the field settings from one content type to another? Click edit next to a field and observe features in the Settings box and features in the Field setting box. You can change Settings from one content type to another and not affect how that field is used. If you change the Field setting options (for example, Number of values) that change will affect all content types that use that field. Will you want to manage access to the field differently between content types? For example, will anonymous users be able to see an image on Article but not on a Book page? Field visibility and permissions are part of the Field settings, are unique to the field, and are provided via the Field Permissions module. From a content perspective, Drupal's taxonomy system provides a way to assign descriptive tags to nodes, making it easier for your site's visitors to locate related content. From a technical perspective, each Drupal site has one taxonomy made up of multiple vocabularies. Each vocabulary contains multiple terms (or tags). Terms can have parent-child relationships with other terms. One term cannot be assigned to two vocabularies. 1. Click on Structures and then on Taxonomy. 2. Click on Add Vocabulary. 3. Complete the form and save. 4. Add terms to the vocabulary. Note: You can add fields via Manage Fields on the add/edit vocabulary screen. In Drupal 7, a vocabulary is now a field, and field type is a term reference. Use the steps covered in the "Add Fields to Content Types" section to add a vocabulary. Form element options work for both single- and multi-select options for three types of form elements. Autocomplete term widget (tagging) is a free tagging option. This means you can add terms to your vocabulary as you create your content versus being required to use a pre-defined list of terms. Traditional select lists (via the List (text) field ) are still an option with Drupal, but the term reference field can be a viable alternative. List (text) field has the select list and check box/radio button options. Which strategy is best for you? Consider the following scenario. You have a data table with multiple columns and you have enabled sorting on the columns. You click on the column header to sort the field that holds the vocabulary term. The table rows get reordered based on the alphanumeric values of the term in that field. But … what if an alphabetical sort isn't what you need? What if you need to control the order in which table rows are displayed? The List (text) field will sort of the value you store in the database. If you allow a person to select 'Three months prior' from the select list, but assign the value 1 to the database (1|Three months prior), then rows with this value will appear first. A selection of 'Two months prior' set to 2 (2|Two months prior) would appear next. And so on. Once you have used the List (text) field, you cannot edit the a value that has been stored in the database. If the value and label are the same, consider the term reference field. When a node is created in Drupal, the path is /?=node/23 where 23 is the NID (node ID). When clean URLs are enabled on the site and available on your server, the default path for a node is /node/23. Neither option means much to the user or to search engines. Also, they are not very friendly when it comes to defining rules for when a block will appear on a webpage. Hence, we have URL aliases, turning /node/23 into something like /myfavorite- hobby. Drupal comes with the Path module. This module allows you to manually add a URL alias each time you create a node. The Pathauto module provides a way for you to create aliases via content path patterns. For instance, all article paths might look like this: article/titleof- node where the title is provided with the [node:title] token. The screen shot below provides some examples. When you are creating a node, you fill in the fields that are part of the content type form. The order in which those fields appear in the add/edit form is controlled by the same place you add fields, Manage fields. The order in which the fields appear when the node is viewed by the public is controlled using the content type's Manage Display feature. You can perform the following tasks. - Reorder the order of the fields. Click+hold+drag the + sign next to the field to reposition the field. - Manage the label display: Above, Inline, or . Choose a format for the data to be displayed. Not all fields have format options. Refine formatting. Some fields allow you to take formatting a little further. For example, you can choose the image style you want for your Image field. (see "Image Styles" later in this card). Sometimes you need a list of menu links to appear in a section of your site. For example, a menu called About might include a link to Partners, History, Methodology, and so on. The About menu would be a block that you can place in a region and set to show only on the pages in the About site section. 1. Click on Structure and then on Menus. 2. Click on Add Menu. 3. Provide a menu title (a name for your menu). 5. Add menu items (links to pages) to your new menu. 2. Click Add Link next to the menu of choice. 3. Complete the form. Note: the URL path needs to exist first in order to add it to the menu. When you create a node, you can add that node to a menu via the menu tab. You can also add nodes to menus via the menu admin interface. The Views module creates page displays and a way for you to assign that page to a menu without having to go to the Menu admin pages. The Panels module provides the same type of option. Some modules will add a page to a menu for you. The Forum module adds the Forums link to the Navigation menu when you enable that module. You can move the link to another menu if you wish by editing the menu item. Drupal 7 comes with three text formats: Plain text, Filtered HTML, and Full HTML. All roles on the site have access to plain text. You can select which roles utilize the HTML format options. 1. Add the table tags to the list of allowed HTML tags by configuring the Filtered HTML format. 2. Give your users permission to choose Full HTML. Be careful with this as it gives your user a lot of power. To manage text formats, go to Configuration > Text formats. 1. Use the WYSIWYG module and add an editor library such as CKEditor, TinyMCE, or others. You can add as many as you like. Assign the editor to a text format. 2. Use a module dedicated to one particular editor such as the CKEditor module. Buttons should match the tags permitted by the text format to which it is assigned. There are many ways to put an image on a page in Drupal. Below are four options to get you started. The advantage of this approach is the ability to reuse the images you upload. For example, you can create a page listing your nodes and include a thumbnail of the image associated with the node. The original image would be used but styled to fit using an image style. Image field. Upload an image via a field and display the image from the field. Image field and Insert. Upload an image via a field, hide the image from showing from the field, use the Insert module and insert the image into the body of the node. The advantage of this approach is usability. If you are not going to reuse the image, sometimes it's easier for users to click the image icon on an editor bar. HTML Editor. Install an HTML editor and use the Image editor button to add a link to an image that will be embedded in the body. Images can be uploaded manually to the server or link to an image via a URL. HTML Editor and IMCE. Install an HTML Editor and the IMCE module. IMCE adds a browse option allowing you to upload an image to the server via the Image editor button. When a user uploads an image with the Image field, you can't always predict the size of the image. With an image style, you can manage the display of the image field such that all images have a specific width and/ or height. 1. Click on Configuration and then on Image Styles. 2. Click on Add Style. 3. Give the style a name. Hint: Names like icon, thumbnail or small don't convey much about the style. A name like scale_100w says this style will scale the image (versus resize) and it will keep the image from distorting because the height is allowed to be whatever it needs to be after the width is set to 100 pixels. 4. Add one or more effects to the style to match the style name. This style is now available for use in Manage Display and other modules that use image styles such as Insert, Views, and Panels. Dependencies. Modules can be dependent on other modules. Therefore you might need to install multiple modules to get the functionality you want. Status. Module project pages have status information to help you decide if the module is supported. There are too many indicators to discuss here. 1. Download the module tar.gz or zip file. 2. Upload the file to /sites/all/modules. You might need to create the 'all' and 'modules' directory. 3. Unpack or unzip the file. Note: If you are using FTP, you might need to reverse steps 2 and 3. 1. Click on Modules in the black admin menu bar. 2. Check the box for the module(s) you want. Drupal will remind you if you didn't enable a dependent module. When it does, click Continue and Drupal will do the rest. Review the readme.txt file that comes with the module. Check the module's project page on Drupal.org. Search for online tutorials for the module. Ask for support in the module's issue queue. You learned at the start of the reference card that the theme controls your page layout. Go to http://drupal.org/project/themes to locate a theme you want to use (assuming you aren't building your own theme). Dependencies. There are standalone themes, base themes, and subthemes. Subthemes depend on base themes. Status. Theme project pages have status information to help you decide if the theme is supported. There are too many indicators to discuss here. The process of installing a theme will depend on your server environment. Each theme contains a readme.txt and/or install.txt file with instructions on how to install that particular theme. The general steps are below. 1. Download the theme tar.gz or zip file. 2. Upload the file to /sites/all/themes. You might need to create the 'all' and 'modules' directory. You can enable a core, contributed, or custom theme such as Garland, Stark, Danland, and so on with the following steps. 1. Click on Appearance in the black admin menu bar. 2. Locate the theme you want under Disable Themes. 3. Click on Enable and set default. You can choose to enable a theme and not set it as default, thus giving you the option to configure a change in your current site without anyone knowing until you are ready. Themes vary but there are some consistencies regarding configuration. Each theme will have the following. Toggle display options. These options allow you to enable and disable features such as the logo, menus, user pictures, search, and more. Logo image settings. Note: the image will need to be the right size before you upload. Shortcut icon settings. This is also known as the favicon. Some themes will have extensive configuration options available to you. Omega, Fusion, AdaptiveTheme, to name a few, are base themes that add significant configuration options in the admin interface. Once you have your theme enabled, you are ready to start configuring the blocks for your web pages. There are three decisions you need to make when configuring blocks. 1. In which region will the block appear? 2. Where in that region will the block appear? 3. When should the block appear? There are two ways to choose a region for your block. 1. Click on Structure and then on Blocks. 2. Locate the block you want to position. 3. Either use the Region dropdown or click Configure. 4. If you click Configure, you will be given the option to set the block for all enabled themes at once. 5. If you use the Region dropdown, remember to save your changes. If you have multiple blocks in one region, in what order should they appear? Place the blocks with the following steps. 3. Click+hold+drag the + next to the block to place the block. There are three conditions to choose from: 1. Pages, 2. Content type, and 3. Roles. Pages. When using the Pages option, the condition is based on a URL path. If you declare that all Article nodes will have a path that begins with article, you can set a block for each article node by setting the Pages visibility condition to the following. 1. Only on the listed pages. 2. articles/* Note: This means that all pages whose URL path begins with mysitename.com/articles will show this block. Content types. If you have a block that should appear on nodes of a specific type, regardless of their path, this is the condition you need. Roles. If you want to control who sees the block, select the role. If you don't make any selection, all will be assumed. You can use one or more of the conditions at a time. For instance, if Pages is … and Content type is … and Roles is …, then show block. Throughout this Refcard, I've discussed two roles: anonymous and authenticated. In Drupal 7, there is also a third: administrator. Anonymous refers to those not logged into your site. Authenticated refers to those logged into your site. Administrator can do anything on your site by default. The first user on a Drupal site user/1 cannot be stripped of administrative rights; this user is all-powerful. Use this role with care. 1. Click on People, then Permissions, then Roles. 2. Type the name of the role and click Add Role. 1. Click on the Permissions tab. 2. Check the permission setting for each role. You have several configuration options regarding user accounts. 1. Click on Configuration in the black admin menu and then click on Account settings. 2. Review and edit your options to meet your needs. Included in the account settings admin page are the emails that the system sends out. You can customize these, but remember these apply to all communications versus those that might be associated with one particular event on your site. 2. Click on Add User. 3. Complete the form. Note: if you want to collect more information from the user, you can add fields with the Manage Fields tab. In Drupal 7, a vocabulary is now a field, and field type is a term reference. Use the steps covered in the \"Add Fields to Content Types\" section to add a vocabulary. Refine formatting. Some fields allow you to take formatting a little further. For example, you can choose the image style you want for your Image field. (see \"Image Styles\" later in this card).